It’s now possible to see the design of the new foredeck. Dennis has welded a piece of heavy gauge “U” section steel across the boat. The top of the section of channel is at the height of the new deck plate. The “U” section also forms the structural beam for the base of the front bulkheads and door opening. The lower bulkhead wall has been bought forward by approximately 200mm. This will provide a small compartment forward of the main cabin which will be used for the water pump and bilge pump. 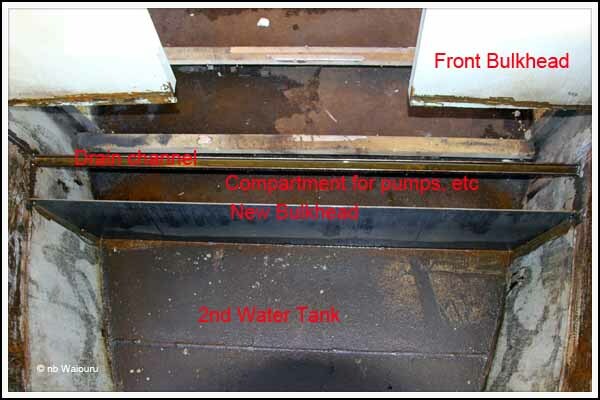 The foredeck is below the waterline so we will require a bilge pump to dispose any water entering the cratch area. Dennis will fabricate a small sump in the area to the immediate lower left of the word “Drain” in the photo above. We are also having a second water tank which is going to be located under the foredeck. The combined capacity of the two tanks will be approximately 175 gallons. The raised deck plate installed by Ben Harp is convex in shape to create a self draining area. As our deck will not be self draining the new plate will be flat. The section of deck plate being remove will be used as a template to size the new section of steel Dennis has setup on the trestles. By tomorrow the new deck should be cut to size and Dennis will have commenced work on the bilge sump and extension to the original forward bulkhead. After that the new diesel tank and storage locker will be fabricated.